These exercises may seem artificial, but sometimes a little external encouragement, a little group activity can really help. Just like I stick to my walking regimen because I do so with a friend. The days we don't walk, I just don't self-motivate myself out there! This was yummy (I used almonds instead of walnuts, which was great). I do think my S.O. had it right though, in that pomegranate seeds are always better in theory than execution. They look awesome and have a nice sweet-tart flavor, but they do add this gritty texture into the dish. This was easy, spicy, and fed me for three days! Would definitely make again. The book suggests using a brand of "shrimp balls" I've never seen in a store, so I used the vegan prawns that are carried in Whole Foods, and they worked great. There were a ton more recipes I wanted to try from Betty Goes Vegan, and I'm a little skeptical of my own patience and taste for cooking Indian food...so I may still fit a few more Betty recipes in this month. 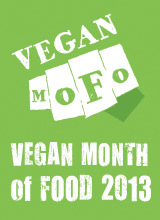 So, are you participating in #VeganMoFo and did you make it into the blog roll?